BEAVERTON — Sharon Niver is glad to have a Catholic place to heal. A member of St. Elizabeth Ann Seton Parish in Aloha, Niver suffered a shoulder fracture and had surgery. Trying to recover at home, she fell and re-injured the shoulder, leaving her in agony and in need of another operation. This spring, she’s recovering and getting physical therapy in Maryville’s new rehabilitation unit. 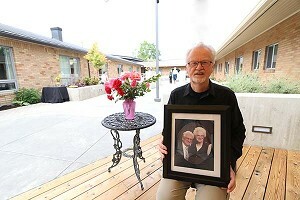 Maryville — long a home to those who need nursing care and help for memory problems — dedicated a new rehabilitation unit and a special courtyard June 4. The new wing adds 16 beds for men and women who come to Maryville to rehabilitate and go home after surgeries and injuries. Guests have single rooms with private baths and access to cable television and internet. The unit surrounds a courtyard that is a kind of healing obstacle course. The therapy courtyard includes walkways, stairs, a bridge, cobblestone and wood decking — surfaces that patients navigate to gain strength and stability. Archbishop John Vlazny blessed the new wing and courtyard with holy water and prayers. 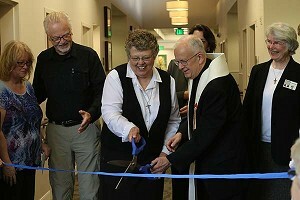 The retired archbishop and Sister Charlene Herinckx, superior general of the Sisters of St. Mary of Oregon, cut a thick blue ceremonial ribbon to mark the occasion, 52 years to the day after Maryville’s founding by the Sisters of St. Mary of Oregon. “We are as committed to serving with love as we were on that very first day,” said Sister Adele Marie Altenhofen, president of the SSMO Ministries Corporation, which oversees Maryville and the Valley Catholic School system. The courtyard is a gift from the estate of Joseph and Edith Cholick. The Cholicks met the Sisters of St. Mary of Oregon in the late 1940s at Holy Cross Parish in North Portland, where the sisters taught at the parish school. Joseph died in 2011 and Edith in 2013. Their wills left a sizable gift to Maryville and did not specify the purpose.